Formed in 2001, Restoring Our Heritage was established with hopes of stemming the overwhelming tide of cultural decline within the United States through educational efforts. 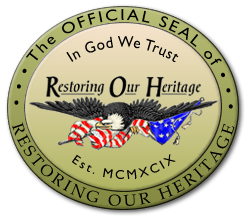 Formally "Grassroots - Restoring Our Heritage, Inc.", we are a not-for-profit 501(c)3 organization based in Evansville, Indiana. We at Restoring Our Heritage wish to see the United States of America remain a "nation whose God is the Lord" as Psalm 33 lays out in the Bible. It is our sincere desire to witness fellow Americans reclaim a widespread understanding of our nation's solid biblical foundation and its importance to our way of life. To that end, we have hosted numerous conferences with nationally-recognized speakers, been invited to discuss these topics in numerous area schools, participated in many public celebrations and events, and more. This has led to thousands in various venues hearing messages focusing on our overwhelming Christian Heritage and we have had no shortage of blessing from those efforts, including receiving keys from cities which have also proclaimed days of celebration in our honor as a consequence. Mission: "Educating Americans of the Founding Christian Influence and Heritage of the United States of America"
Vision: To provide means of education for the purpose of better understanding among the populace of our Christian Heritage. We do this by providing events featuring recognized speakers who have expertise with related topics, by distributing printed and digital materials and resources consistent with our message and promoting those efforts, procuring outreach efforts to public institutions and public officials, and by participating in community events and activities whereby we can interact with the public for that purpose.